Fonte do tÃ­tulo prÃ³prio: Title of fonds based on contents. 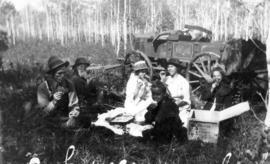 Nicholas Andress came from the United States to Alberta in 1912, traveling over the Edson Trail that year with his wife and five children: William, Ellis, Charles, Ellen and Elmer. They were accompanied by Elmer's wife Martha and his children (Merle, Ivah, and Laverne); Will's wife, Jessie and 2 daughters (Theresa and Nada); the Rockefeller family, who were some relation; and Allen Petty. Martha kept a diary of the journey which started on August 29th in Edson, and ended at Grande Prairie on October 7. Nicholas, Charles and Ellis took homesteads beside Dead Horse Creek (later renamed Crystal Creek) in Township 71, Range 4, about 10 miles east of Grande Prairie, and Elmer and William filed in the same area in 1914. In 1920, the Rockefeller family returned to the USA. Mrs. Andress passed away in 1920 and then Charles Andress, the third son, lost his life in a sawmill accident. As the children married, they moved away, and in 1926 Nicholas returned to the United States with his sons Ellis and Elmer and their families. Only Allen Petty remained in this area. He passed away in 1954. The photographs were donated to the Grande Prairie Museum by the grandchildren of the Rockefeller family, who had no idea of who the people in the photographs were. 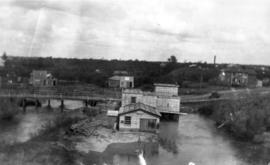 The photos were identified by local pioneers and were transferred to the care of Grande Prairie Regional Archives when it was formed in 2000. The copy of the diary was donated to the Grande Prairie Old Timers Association for use at one of their annual banquets, and came to the Archives in 2011. Neither was officially accessioned by the Museum. An accrual to the fonds of 25 images (25 photographs and 14 negatives) was donated by the GPPL to SPRA on October 22, 2013. Prior to this, the images had been housed by the library with the Isabel Campbell collection, in a file labelled "Rockefeller prints, negs". Some of the images are duplicates of those already in the fonds, but it also contained 5 new images. The best print (initial or accession) was retained while duplicates were discarded. All negatives were retained. The fonds consists of a copy of the diary of Martha Andress as they traveled over the Edson Trail from August 29 to October 7, 1912; and 24 photographs of the Andress family, Allen Petty, and events and scenes in the Grande Prairie area between 1913 and 1926.